Archaeologists working at the Thang Long Citadel in Hanoi have discovered the layer dating to the Ly Dynasty (1009-1225) and thought to be one of the earliest and most central positions of the citadel complex. Archaeologists working at the Thang Long Citadel in Hanoi discover the remains of Ly Dynasty architecture and water system beneath the existing foundations. I’m back in Singapore for the weekend and one of the items on my to-do list was to visit the Vietnam: From Myth to Modernity exhibition at the Asian Civilisations Museum. When this exhibition first opened, I had only just started my stint up north, so I was glad to finally have been able to catch this exhibition before it closed at the end of this month. If you’ve been a loyal reader of this blog, you would have realised that by far, Vietnam is the most prolific country in terms of archaeological news that gets published here – this is in part because Vietnam’s archaeological heritage is quite varied and multi-layered. I haven’t visited Vietnam myself, and I reckon it’d take me at least three or four trips to see everything that I want to see. In this respect, this exhibition did quite a good job in revealing the breadth of Vietnam’s history from prehistory to modernity through the country’s artifacts. Read on to discover Vietnam’s archaeological heritage. The Vietnamese government has completed its documentation of the ancient capital of Thang Long (Ha Noi), required for submission to UNESCO for World Heritage consideration. The Vietnam Institute of Archaeology releases the results of an excavation of a Ly Dynasty temple site in Bac Giang province. 16 October 2007 (New York Times) – The New York Times carries a well-written feature on the current archaeological excavations going on in Hanoi, seeking to understand the ancient capital of Thang Long, which was founded by the Ly dynasty a millennia earlier. The excavation is said to be the largest of its kind in Southeast Asia. Nine hundred years before Ho Chi Minh declared Hanoi the capital of a newly independent Vietnam in 1945, the first king of the Ly Dynasty issued a similar decree. 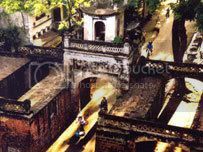 20 Feb 2007 (Thanh Nien News) – A joint Japanese-Vietnamese venture to preserve an 11th century fort in Hanoi. The citadel was built by King Ly Thai To, the first emperor of the later Ly dynasty who officially named the kingdom “Dai Viet”. Japanese experts will help Vietnam preserve the Thang Long Citadel in Hanoi, a fort which was the seat of an 11th century kingdom, a conference heard Monday. At a meeting titled Thang Long Citadel Preservation held by the Japan-Vietnam Cooperation Committee, experts from the two countries also decided to study ways to make the citadel an on-site museum.